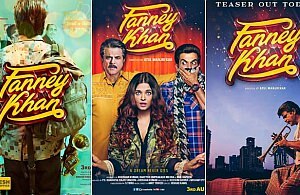 Prashant Kumar “Fanney Khan” (Anil Kapoor), a part-time vocalist in an orchestra, dreams of becoming a singer but circumstances prevent him from being one. After marriage and heading a middle class family, he fuels his dream through his overweight teenage daughter Lata Sharma (Pihu Sand), named after singer Lata Mangeshkar. Lata constantly fails in making an impact on muscial shows, and is booed upon due to her weight. Out of desperation to make his daughter a singer after he is fired from his job, Fanney kidnaps well known soloist Baby Singh (Aishwarya Rai) with the help of Adhir (Rajkummar Rao). He demands that Lata be heard on a music show lest he kills Baby.